However, the number of physical stores in the Fashion and General Clothing category has declined across all regions in GB in the last 12 months; the largest of which has been in Yorkshire and the Humber with -6% net change. There are plenty of news stories which illustrate the struggle that many GB stores face from e-commerce stating that “the future of retail is online”, so it seems almost counter intuitive for an online brand to open up a physical store. However, Joe Browns isn’t the first online clothing retailer to venture into shopping malls. Popular online fashion brand, Missguided, made its way into UK retail locations back in 2015; firstly, through concessions in three of Selfridges’ department stores, then by opening two of its own brick and mortar stores in Westfield Stratford City and Bluewater shopping centre in Kent. Yet this isn’t just happening in the fashion world; other large ‘e-tailers’ have experimented with traditional retail since establishing their online business. In the US, Amazon has opened its first Amazon Go store; which uses retail technology to eliminate the need for checkouts. The company also have thirteen brick and mortar bookshops; the shelves of the stores display the covers of the books rather than the spines in order to showcase the authors and their work. According to Amazon, instead of creating an efficient use of space, they want customers to interact and engage with the brand. Multinational technology company, Microsoft, are currently looking for a flagship location as their first physical store in the UK. It will follow in the steps of its competitor, Apple, who currently have 36 Apple Stores in GB - 86% of which are located in shopping centres, whilst the other 14% of stores can be found on the high street (Source: LDC). 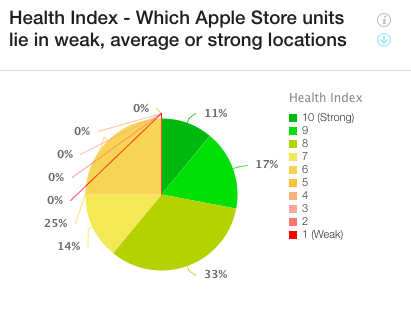 All of these locations have an LDC Health Index Score of 6/10 or above, which gives an insight into the performance and attractiveness of a particular high street, shopping centre or retail park. 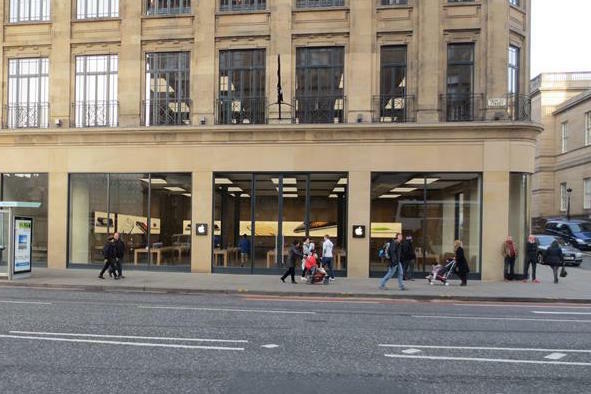 One of the four Apple Stores locations which achieves a 10/10 on the LDC Health Index is located on Princes Street, Edinburgh. By analysing the 42 LDC SmartStreetSensor footfall tracking devices deployed in Edinburgh, it is clear to see that Princes Street is one of the busiest streets in the city – with peak footfall between 16:00 and 17:00. As well as displaying Apple products and accessories, the Apple Store has a Genius Bar so that customers can come into store to ask technical questions or to get their products fixed. It may be that Microsoft follows this idea – after all, their products are already sold by many other retailers across the UK. To make their store different, Microsoft will create a place where its customers can experience the brand first-hand. Nonetheless, online delivery service provider, Doddle, have opened a multitude of stores across GB over the last few years, many of which have subsequently closed; most notably stores located on the high street which has recently seen a -60% net change in 12 months. It may be that Doddle initially opened these stores to raise awareness of their brand. As the online marketplace has become so competitive, it can be very costly for companies to get their products and services to appear on the first page of search engine results. Opening a physical store is an alternative way of increasing customer awareness. Take car showrooms as an example: there has been an +80% increase in Tesla stores located in shopping centres over the past 12 months (Source: LDC). However these stores are not as large as a typical car showroom; instead, Tesla uses the store to raise awareness of their products and create an experience for potential customers. However, high costs of occupancy mean collection centres have been closing in favour of partnering with existing retailers who have large networks and benefit from the additional footfall to their stores. Companies who are looking to improve their brand awareness may be good target occupiers for persistently vacant units because they can occupy the unit in the short term, thus improving the site’s attractiveness for future occupiers. The running theme seems to be that, although built like traditional brick and mortar stores, these shops haven’t acted like traditional stores. Instead, they have focused on providing the consumer with experiences. In the words of Joe Browns’ founder and managing director, Simon Brown, the new store has “achieved what we set out to do, which was to create an impressive three dimensional version of our catalogue”. It seems like the future of retail is not necessarily online, but instead it is being driven by the rise of the experience economy: consumers are choosing to purchase experiences over products. All of this demonstrates that retail technology is not something to fear, but should be seen as a complement to the existing retail offer and growth in experiential retail.